Whether you are looking to score a touchdown, hit a home run, kick the winning goal or slam dunk, appsbar is the best play to make your team a custom mobile phone and tablet app for free. Your fans will be able to easily follow your upcoming games, stats, scores, roster, videos and social networking profiles. 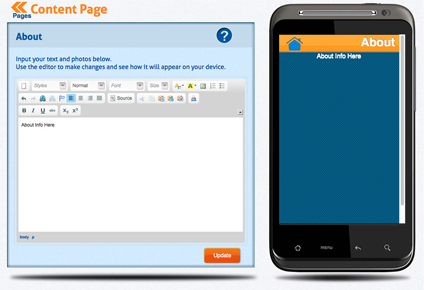 Our patent pending technology has opened the door for everyone to create an app. appsbar has made mobile app building completely free regardless of how many times your app is downloaded. There are so many people searching the web for new smartphone apps every day, you may be surprised at how many people find your app. Our community of app makers have created individual apps that have seen tens of thousands and hundreds of thousands of downloads. Another advantage is we have created an equal playing field for individuals and organizations with no previous app making experience to learn how to build an app in a matter of minutes. We bring you right to the finish line, so you can concentrate on the important information you would like to share. The apps settings will allow you to name your app, upload an icon or logo for the app and you may add a custom splash screen. In addition, you will be asked if you would like to enable our app commerce feature that allows you to sell merchandise and sponsorships. The commerce feature is included for free and all that is needed is to simply connect to your PayPal account to accept payment. We have created seven pages for you to fill in, made specifically for sports apps, plus you can remove or create new pages as you choose. Naturally, you may update your app as many times as you like. 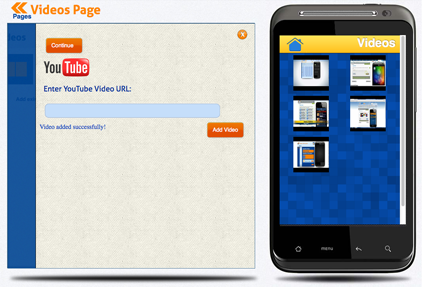 Once your app is completed and published, it will be published to Google Play and the free app market appcatch. 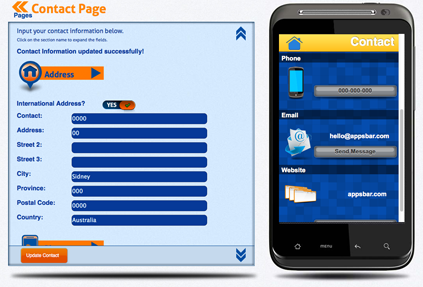 Your fans and supporters can download your app to their Android, iPhone, Windows Phone and Blackberry devices. The About Page allows you the ability to use text and images to represent your team, town, school, history and any other information you would like to provide. Did your team win the championship last year? Does your team play for a sponsor? This is the page to let the world know. 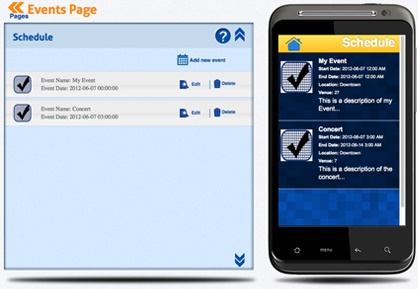 The Schedule Page lets your app users know about your game times and any upcoming events that you have planned. Just plug in the dates and times so that no one misses the big game. The Roster Page is where every player gets their chance to shine. 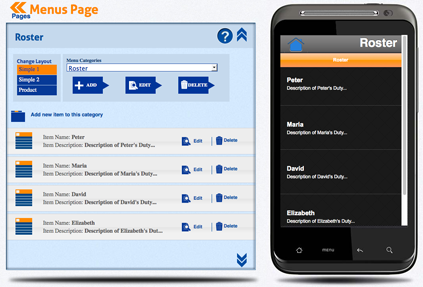 You can list everyone individually, add their picture and bio. Quarterbacks, wide receivers, centers, pitchers and catchers. 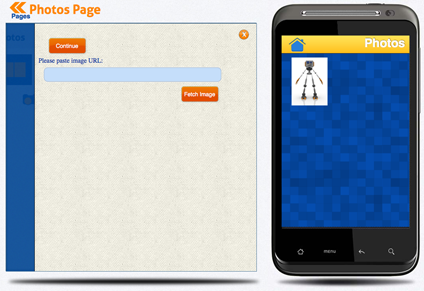 The Photos Page gives you the ability to upload all your photos of your choice. You have the option of choosing from multiple layouts. This is your place to feature all of your action shots and team photos. There are some great memories to be had in your sports app photo gallery. The Videos Page gives you Game footage, practice clips, interviews, and fan reactions all make for an amazing user experience. 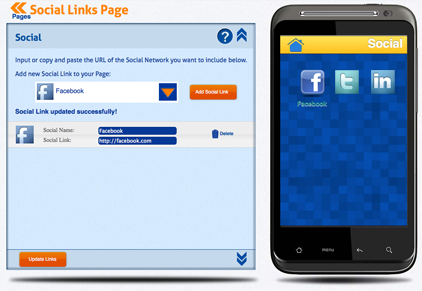 Now you can have all your social links in one place. appsbar makes it easy for people to follow you on all your social media pages at the same time. The Contact Page allows for people to get in touch with your sporting organization by phone, email and address.